I did it. About two weeks ago, I finally bought the Antigona (medium grainy leather) I've had been loving ever since I laid eyes on it in 2011. I think it's the most beautiful bag ever and I'm so happy with it! While at first I was convinced I wanted to get the smaller size (which I first saw on The Blonde Salad), I changed my mind after trying both bags on a few times. The larger size can also be good for traveling and carrying my laptop if I needed to; and there's only a small difference in price. The second strap also means I can carry it on my shoulder, which was less convenient with the smaller size. While I usually go for gold jewelry, I really like the silver hardware on this bag as it makes it look more modern and structured in a way. 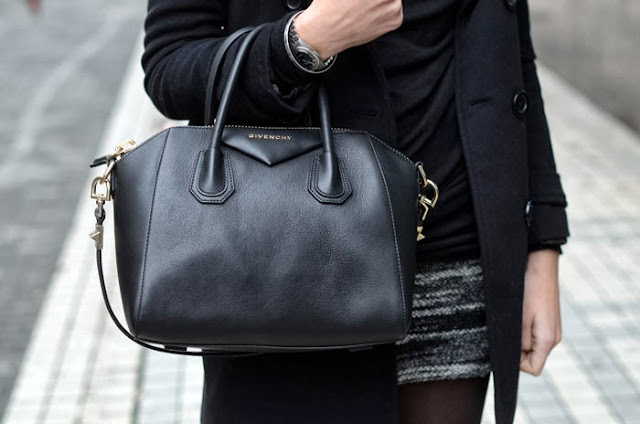 Miranda Kerr is also a big fan of this handbag and wears it with anything. It's really versatile and a real modern classic.